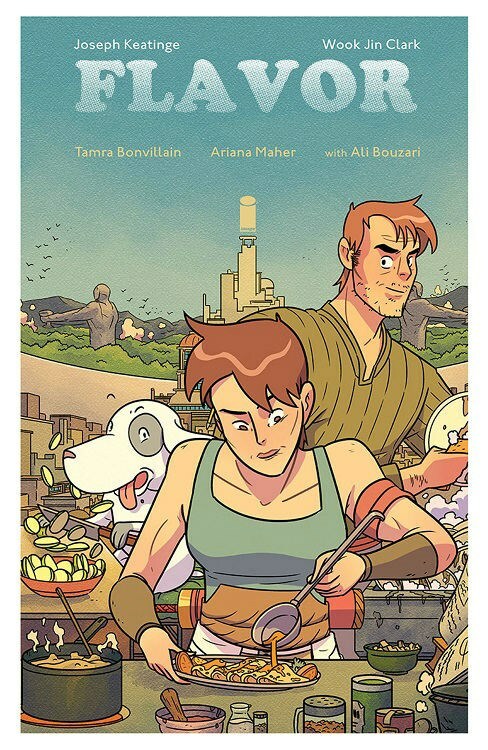 I like graphic novels and I like stories that involve food and cooking, so I was excited to read Flavor (Image Comics, November 27), written by Joseph Keatinge with artist Wook Jin Clark. The main character is Xoo Lim, who is single-handedly trying to save her parents' crepe restaurant, while also finding a way to heal them from a mysterious illness. She's underage and unlicensed, but her uncle Geof serves as the figurehead, keeping the officials at bay. Xoo lives in a walled city where cooking is king, people fight over truffles, hot peppers can be used as weapons, and bars serve ice cream instead of alcohol. Her dog, Buster, helps in the kitchen and is literate. Another plot line involves shady evil officials who are perhaps guided by the gods. We also have an up-scale culinary academy, a dangerous culinary underworld, and life-or-death cooking contests. And of note, Geof seems to be harboring his own secrets as well as an overindulgence problem when he visits the bar. Flavor collects the first six issues of the comic, setting up the world in which Xoo lives. The artwork pops, and the emotions and personalities of the characters are clearly rendered. Each sector has a slightly different color scheme, so it's easy to tell whether we're at the academy, in Xoo's home, or in the city itself. 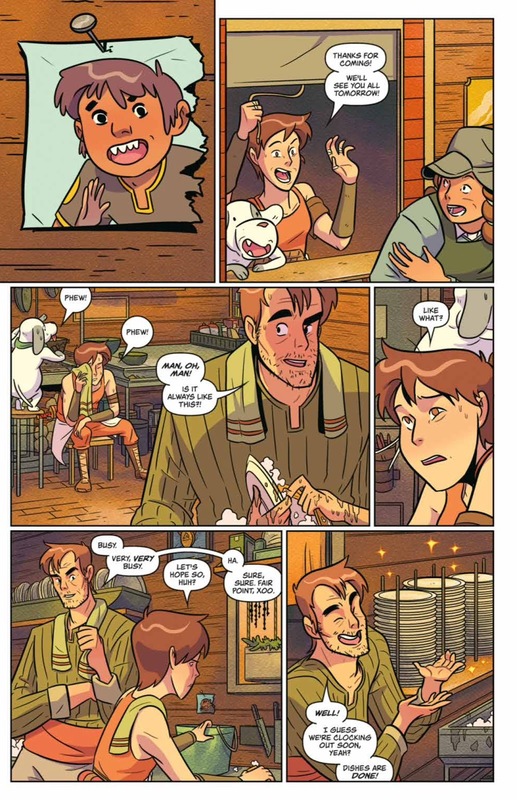 The sample page shows Xoo, Buster, and Geof at the restaurant (click to enlarge the image). Without giving up spoilers, the core of the story revolves around Xoo and Buster and the various plans they have to help Xoo's parents. Geof's motives for attempting to support Xoo are unclear. And, in fact, there is a lot about this comic that is unclear to me. For example, even after six issues, I'm not at all sure how the different plot lines will come together. I was also confused by Xoo's gender, which may be part of the point, but I'd like to have some kind of hint. On the other hand, I really liked Buster the dog. He's not only cute but he seems to be the most practical and down-to-earth character in the book. I also kind of love to hate Geof, and I'm still trying to figure out whether he cares about his brother's family or if he's only in this for himself. There are a couple of cooking contests in this collection, and we learn that Xoo's specialty is definitely crepes. At the end of the book we find a crepe recipe and a little blurb on culinary science. What we don't find at the end of the book is a solid conclusion . . . because the book ends on a major cliff-hanger. Argh! 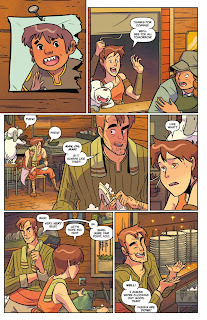 I have mixed feelings about Joseph Keatinge's comic series Flavor. On the one hand I like some of the characters and really like the artwork. On the other hand, I didn't connect strongly with any of the story lines, and I have the uneasy feeling that I missed some key point. Will I look for the next collection? I might. Can I recommend this series? Not wholeheartedly. Do you make crepes? I've made them only a couple times. In my family, it's my sister-in-law who reigns as the crepe queen. Using hot peppers as a weapon makes total sense to me! Graphic novels challenge me -- I read too fast and miss some of the visual clues. This one sounds pretty difficult for various reasons, as you say. I too like a clear resolution. You didn't mention if this is a translated graphic novel from one of the strong graphic traditions (like French or Japanese) or if it's original language is English/American. Sometimes that matters. Crepes sound good. If all goes as planned I will be eating some of them in Paris on Sunday. 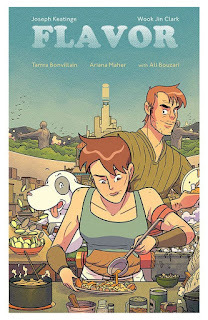 I haven’t looked at a graphic novel in a while but a foodie format appeals to me. It sounds like this one is a bit uneven but maybe the next book in the series is better. I used to make crepes every once in a while but haven't in a long time. We have several fabulous crepe restaurants around here so we just go to one of them when we have a crepe hankering. This sounds interesting and worth checking out even for just the foodie aspects and for Buster. ;-) Thank you for sharing. I love graphic novels too and don't know why I don't read them more. I've never had a crepe. Maybe I should try one soon. Finally finished weekly update. Writing this on the bus to Seville. I don't make crepes, but my daughter does. And I've never read a graphic novel, if you can believe it! My sister-in-law is the crepe queen too! Wherever we go, she always finds the best places to get crepes.